Citation: Huiqin He, Thomas Monaco. Vegetation structure and species composition variation of roadside slopes in Sichuan Basin, China. J Agric Sci Bot 2018;2(1):3-11. Sichuan Basin in southwestern China is a region of great conservation concern, yet little is known about the influence of edaphic factors on plant community dynamics of disturbed areas. We used multivariate analyses to identify differences in vegetation structure (i.e., tree, shrub, forb, and graminoid) and species composition between sandstone and shale substrates across 13 successional forest plant communities that varied in soil depth and soil texture. Vegetation structure did not differ between substrates (P >0.05), but plant community composition varied significantly (P = 0.0017). In addition, six indicator species were identified, including two native perennial grasses; namely, Imperata cylindrica for intermediate soil depths (20-30 cm) on sandstone substrate (P = 0.016) and Miscanthus sinensis for greater soil depths ( > 30 cm) on sandstone (P = 0.012) as well as on intermediate soil depths (20-30 cm) on shale substrate (P = 0.0002). Imperata cylindrica and M. sinensis were also the most dominant perennial grass species on sandstone (15.6 ± 5.3% cover) and shale (12.3 ± 4.9% cover), respectively. These patterns provide insights into species interactions and successional dynamics of roadside slopes, and offer guidance when choosing suitable species for future restoration projects in the Sichuan Basin. Dominant species, Functional group, Indicator species, Sandstone substrate, Soil depth, Shale substrate, Vegetation pattern, Plant species richness, Multiple response permutation procedure (MRPP). Road construction is necessary to support commerce and transportation, yet it is a pervasive disturbance with far-reaching impacts on vegetation and plant community composition [1-3]. Vegetation recovery is essential to stabilize slopes , ameliorate compacted soils , increase water infiltration capacity , and reduce erosion and sedimentation of watersheds . Roadside vegetation also provides refugia for the conservation of isolated or relict populations of plant species in highly modified regions where novel ecosystems are emerging . However, vegetation recovery following road construction is dynamic, variable, and is strongly influenced by underlying edaphic and environmental conditions [8,9]. Clarifying the influence of edaphic factors on plant community structure and species composition may provide valuable ecological indicators and inform future restoration projects [10,11]. Roads often traverse heterogeneous substrates (e.g., parent materials/rock types) [12,13] that directly influence additional edaphic factors [14-17]. In particular, substrate variability influences soil depth  and soil texture , which both can have long-lasting influences on vegetation and species composition of roadside slopes [20-22]. For example, soil depth and texture are strong determinants of nutrient content , which subsequently influences plant species diversity and long-term species persistence following disturbance [2,24]. In addition, soil nutrient availability is generally lower in coarse soils and declines with soil depth [18,25]. Accordingly, soil depth is a major driver of vegetation structure and plant community composition [26,27]. Soil depth, thus, influences resource availability and competitive ability of species [28,29], vegetation recovery following disturbance [12,30], and can determine which species become dominant within a plant community. However, because both soil depth and texture simultaneously vary across edaphic gradients [29,31], it is essential to account for such differences when interpreting vegetation patterns [17,32]. Given the complex influence of soil conditions on species composition, there is need to characterize how these edaphic conditions control species dominance and create unique vegetation patterns [33,34], especially over broad geographic regions that encompass numerous parent material substrates [32,35]. Sichuan Basin is a dominant geographical feature in southwestern China with relatively consistent climatic influence; however, edaphic and environmental conditions are highly variable due to topographic heterogeneity of sedimentary rock substrates . The original temperate forest vegetation of low hills and alluvial plains, however, has mostly been eradicated due to thousands of years of agricultural conversion , logging in the past century , and more recently with shale gas exploration and development. Although endemic plants have been replaced by widely distributed species , remaining roadside vegetation provides refugia for endemic plant species and the opportunity to assess vegetation recovery patterns across heterogeneous sedimentary substrates. Previous research in this region found species composition along roadway slopes was influenced by substrate, soil texture, and soil depth [39,40] but vegetation patterns have not been characterized for these edaphic factors. Furthermore, plant litter characteristics along slopes are known to be complex and only loosely correlated with dominant species abundance . The possibility that distinct plant communities assemble on different substrates has not been investigated in this region, yet this information could provide useful indices to guide future conservation and restoration activities in similar regions threatened by heavy disturbance and rapid species loss. 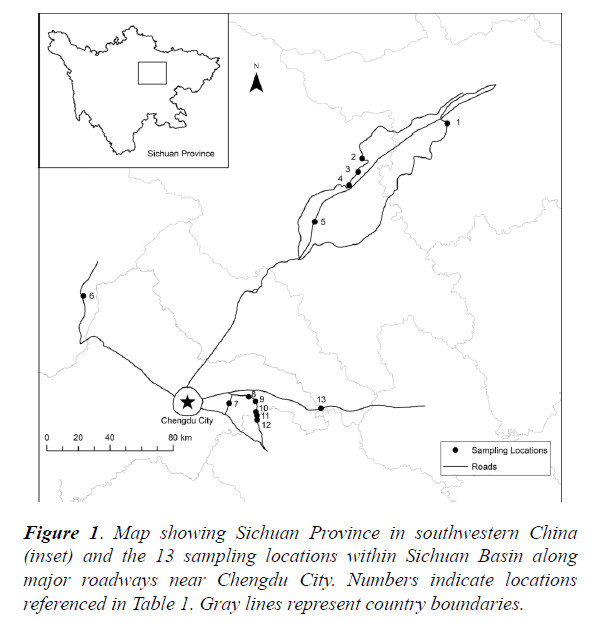 In this study, we assessed variation in vegetation structure and plant community composition of sandstone- and shale-derived soils along express highways radiating from the capital city of Chengdu outward into the Sichuan Basin in southwestern China. Our primary objectives were to: (1) identify key differences in vegetation structure and plant community composition between sandstone and shale substrates; and (2) within each substrate, determine whether vegetation structure and plant community composition vary among levels of soil depth and soil texture classes. We expected large differences in vegetation between substrates given the prevalence of shale soils at higher elevations where forest succession is more advanced compared to the lower elevation sandstone soils where herbaceous species dominate. However, the influences of soil texture and soil depth on vegetation structure and species composition is unknown; thus, our assessment provides a rudimentary framework to recognize roadside vegetation patterns, identify indicator species for substrates, and better understand species interactions. This assessment is essential to assist practitioners in choosing appropriate restoration species to stabilize slopes and improve species diversity similar regions. The experiment was conducted within Sichuan Basin in southwest China (26°03′–34°19′ N, 97°21′–108°31′ W), which is characterized by a subtropical, moist climate with a distinct dry season between June and October and mean annual (1994-2014) temperature and precipitation values of 17.3°C and 826 mm, respectively . The primary soil types within the basin include soils developed from either basalt or sand-shale substrates with high amounts of clay minerals, especially Fe-Al oxides . The original vegetation is locally known as broad-leaved forest, often dominated by large-statured trees (i.e., Castanopsis fargesii and Cyclobalanopsis glanuca [44,45]). We sought to assess plant communities adjacent to major roads radiating from Chengdu City. In this region, the original forest vegetation was destroyed during road construction and current plant communities reflect various stages of natural succession over a 7–70 year period. Large study locations capable of supporting multiple, within-site sampling plots were limited due to the high level of urban development and uncertain disturbance history in this region . Thus, road construction records from the Sichuan Province highway department were consulted to determine disturbance history for roads constructed between 1939 and 2002 that were located at a set distance of 250 km from Chengdu City. We then visited potential locations, specifically looking for natural vegetation that covered an area greater than 2 hectares and contained a mixture of various successional stages composed of herbaceous/graminoid, shrub and tree life forms. Our search yielded 13 suitable locations that met these criteria (Table 1 and Figure 1). Our objective was to assess the widest possible variation in successional stages within each location and across the region. Table 1. Location, elevation, slope degree and slope aspect of 13 sampling locations used to characterize where vegetation and soil samples were collected along roadside slopes in Sichuan Basin, China. Figure 1. Map showing Sichuan Province in southwestern China (inset) and the 13 sampling locations within Sichuan Basin along major roadways near Chengdu City. Numbers indicate locations referenced in Table 1. Gray lines represent country boundaries. At each location we randomly selected a 20 m × 100 m (i.e., 2000 m2) sampling area and sampled vegetation within 3, 5 m × 5 m randomly located plots. Plots were situated at least 10 m apart and at least 5 m from the bottom of the slope. This design resulted in a total of 39 sampling plots, which were considered independent experimental units due to the high level of within-location heterogeneity. Percentage canopy cover for each species was estimated visually to the nearest 1% in each plot. Canopy cover was defined as the proportion of ground area occupied by the aboveground parts of plants, i.e., the area covered by the vertical projection of plant canopies and tree crowns . To aid in estimating cover of large trees, a cord was placed on the ground within plots to indicate canopy edge. Thus, total plot cover often exceeded 100% when canopies were multi-layered. Each species was also assigned to one of seven functional groups (annual forb, annual grass/sedge, perennial forb, perennial grass/sedge, shrub, tree, and vine) and cover values were summed for each group. Soil from the surface horizon (0-10 cm) was sampled with a 3 cm diameter corer in nine random locations within each plot. Soil samples were placed in sealed plastic bags, transported to a laboratory bench, and air-dried with bags open for 7 d at 25°C. Soils were sieved through a 2 mm diameter mesh and a 25 g sample was prepared to determine percent sand, silt, and clay and classify soils into the textural classes (i.e., pack sand, loose sand, and sandy loam ). In addition, a 15 g sample from each plot was leached with 20 mm distilled water, mixed for 1 min, then allowed to settle for 30 min before measuring soil pH with a glass electrode . Soil depth of each plot was determined by inserting a 1.8 m steel rod vertically from soil surface until it was stopped by parent material , which then were classified by depth into four levels (i.e., 0-10 cm, 10-20 cm, 20-30 cm, >30 cm). Soil substrate was determined using physical characteristics . Based on this assessment, we identified a total of 22 sandstone and 17 shale plots. On average (± SE), shale plots were located at higher elevation (670 m ± 123) with steeper slopes (47° ± 4) compared to sandstone plots (455 m ± 69 and 38 ° ± 25 respectively). To address Objective 1, we analyzed percentage cover for species that occurred across both sandstone and shale. Datasets were then relativized using Beals smoothing, a technique recommended for datasets that contain many zero values . Differences in plant community composition (P < 0.05) between sandstone and shale substrates were analyzed with Multiple-Response Permutation Procedures (MRPP; T test statistic ) using Sørensen distance measures . We also analyzed differences between substrates for each vegetation structure category (i.e., percentage cover for the seven functional groups), soil pH, and soil texture proportions (i.e., sand, silt, and clay) with Wilcoxon one-way rank sums tests (χ2 test; df = 1; P < 0.05) using JMP ver. 13 (SAS Institute Inc. Cary, NC, USA). Lastly, we assessed Objective 1 with indicator species analysis (ISA ) using raw (non-relativized) percentage cover values to identify species that are both reliable and faithful to each substrate. Significance was based on Monte Carlo randomization tests comparing observed and random indicator values (4999 permutations; P < 0.05). To determine whether distinct plant communities develop under levels of soil depth and soil texture classes (Objective 2), we performed separate MRPP analyses for sandstone and shale. We then used ISA to identify species that are both reliable and faithful to levels of soil depth and texture classes. MRPP and ISA analyses were performed using PC-Ord ver. 7 (MjM Software Design, Gleneden Beach, OR). Lastly, we calculated mean and standard error percentage cover values to determine whether indicator species were also the most abundant (i.e., dominant) species within substrates or specific edaphic factors. A total of 42 plant species occurred across the sandstone and shale substrates. The highest and lowest species richness values were found for perennial forbs (n = 13 species) and trees (n = 2), respectively (Table S1). Fifteen species were common between substrates, yet many species were unique to a specific a substrate [i.e., sandstone (n = 14) and shale (n = 13)]. Relative to shale, there were more forbs and no tree species on sandstone (Figure 2). Figure 2. Number of unique species encountered within the seven functional groups for sandstone and shale substrates. No differences in vegetation structure (i.e., percentage cover of functional group categories) were found between substrates (χ2 tests; P > 0.05; data not shown). Although soil pH and clay content were also similar between substrates (P > 0.05), sand content was higher and silt content was lower in sandstone than shale, respectively (Figure 3). Figure 3. Box-and-whisker plots showing soil pH, and proportions of soil sand, silt and clay of sandstone- (white; n = 22) and shale-derived (gray; n = 17) soils in Sichuan Basin, China. For each variable, top, bottom, and middle lines of the box correspond to the 75th, 25th, and median, respectively; vertical lines extending from the bottom and top of the box correspond with the 10th and 90th percentile, respectively; and the black squares indicate the mean value. Differences between substrates are based on χ2 tests; df = 1; P < 0.05). Plant community composition was significantly different between sandstone and shale substrates (MRPP, T = -3.98; P = 0.020). Six indicator species, one for sandstone and five for shale, were found among the 39 plots (Table 2). Each substrate contained a significant perennial grass indicator species: Imperata cylindrica was associated with sandstone, and Miscanthus sinensis was associated with shale. No annual grass/sedge, forb, or tree species were significant indicators on either substrate. Table 2. Combined indicator species analysis for sandstone and shale roadside plots (n = 39) in Sichuan Basin, China. Indicator values  were compared to random values generated by Monte Carlo tests with 4,999 permutations. Only significant indicator species are shown based on the proportion of random indicator values equal or greater than observed values (P < 0.05). No differences in vegetation structure (i.e., percentage cover of the seven functional groups) were found soil texture and soil depth levels for either sandstone or shale substrates (χ2 tests; P > 0.05; data not shown). In addition, no differences in plant community composition were found among soil texture classes and soil depths on sandstone substrate (MRPP, T = -0.11 and -0.95, respectively; P > 0.05). Similarly, plant community composition did not vary among soil texture classes and soil depths on shale substrate (MRPP, T = -0.16 and -1.75, respectively; P > 0.05). Perennial grasses were the most common indicator species identified for edaphic conditions on sandstone and shale substrates (Table 3). For sandstone, the perennial grass Cymbopogon goeringii was an indicator of sandy loam soils, whereas the perennial grass I. cylindrica was unique to soil depths of 20-30 cm. Soils deeper than 30 cm were represented by the reliable presence of the perennial grass M. sinensis and the annual sedge Cyperus microiria on sandstone. In contrast to sandstone, no species were indicators of soil texture classes on shale substrate. However, soil depths were distinguished by the perennial forb Caulis fici at 10-20 cm and the perennial grass M. sinensis at 20-30 cm. Indicator species specific to sandstone and shale substrates (i.e., I. cylindrica and M. sinensis, respectively) were also the most abundant (i.e., mean ± SE percentage cover). For example, percentage cover of I. cylindrica was five-fold greater on sandstone than shale substrate (15.6 ± 5.3 vs. 2.8 ± 1.9). However, its dominance was most pronounced at intermediate soil depths (20-30 cm) where it existed nearly as a monoculture and comprised 53.3 ± 11.5 of the vegetation cover. Similarly, cover of M. sinensis was over three-fold greater on shale than sandstone substrate (12.3 ± 4.9 vs. 3.5 ± 2.3 ) and its abundance was most pronounced at intermediate soil depths (10-20 cm). In contrast to these dominant perennial grasses, the annual sedge C. microiria and the perennial forb C. fici were also found to be indicator species at >30 cm- and 10-20 cm- depth soils on sandstone and shale substrates. Nevertheless, they both contributed little to overall vegetation cover (5.0 ± 3.0 and 2.5 ± 2.5%, respectively). Table 3. Indicator species analysis for sandstone (n = 22) and shale (n = 17) roadside plots in Sichuan Basin, China for levels/classes of edaphic factors. Indicator values  were compared to random values generated by Monte Carlo tests with 4,999 permutations. Only significant indicator species are shown based on the proportion of random indicator values equal or greater than observed values (P < 0.05). The lack of differences in percentage cover between substrates, soil texture classes, or soil depths for any of the seven functional groups suggests vegetation structure was not strongly influenced by these edaphic factors. While we expected structural differences in vegetation, our results are likely a consequence of equitable species diversity within functional groups (with the exception of trees) and the overriding influences of dominant perennial grass within each substrate. Similarly, previous work indicates that functional group diversity (i.e., number of species within a functional group) is more important than species diversity [56,57] because it strongly regulates species colonization and increases ecosystem stability, more so than species richness . Alternatively, our results indicate that variation in roadside vegetation is primarily associated with differences in plant community composition between substrates and among soil texture classes and soil depths. Indeed, our results showed that plant community differences between substrates were not based on species richness, but rather were due to a few species that served as indicators for specific edaphic conditions. These patterns for dominant perennial grasses may also be associated with their ability to acquire more limiting resources and maintain competitive superiority over subordinate other species . Below, we discuss how these subtle differences in species composition provide indicators of edaphic conditions, insights into competitive interactions among species, and guidance to identify suitable species for future restoration of variable roadside substrates in Sichuan Basin. Although distinct differences in plant community composition between substrates were identified, differences were primarily due to only six, out of a total of 59 possible, indicator species. Foremost among these were two large-statured perennial grasses, M. sinensis on shale and I. cylindrica on sandstone, both native species in this area but invasive species in other regions of the world [60,61]. Dominance of these species, however, makes sense when considering their general ecological requirements. For example, although M. sinensis exists over wide variation in soil and climate conditions in its native range in southern Asia , it is also known to be a consistent indicator of advanced forest succession and shaded environments on steep mountain slopes in Japan . This pattern is congruent with our study where shale substrate predominated on slightly steeper and higher elevation locations that were occupied by the only two tree species we encountered. However, there is evidence that when M. sinensis becomes a dominant perennial grass on degraded lands in southern China, it can form dense canopies that hinder tree seedling establishment, even though it improves soil structure and buffers high air temperatures for tree seedlings . In contrast to M. sinensis, I. cylindrica is shade intolerant , adapted to open areas, and rapidly colonizes disturbed sites due to prolific seed production and wind dispersal . Furthermore, its roots produce allelochemicals known to impede root development of tree species  and I. cylindrica has been considered a major barrier to reforestation projects in southern Asia . The ability of I. cylindrica to interfere with colonizing species, combined with the fact that dense woody vegetation along forest edges is known to limit I. cylindrica colonization [68,69], offer plausible explanations for why this perennial grass was a strong indicator of sandstone substrates in our study where, incidentally, no tree species were observed. Greater prevalence of perennial grass indicator species (e.g., 4 out of 6 species in Table 3) relative to other functional groups agrees with previous studies demonstrating their importance to plant community successional dynamics [70,71]. Furthermore, because our principal indicators for sandstone and shale substrates (i.e., I. cylindrica and M. sinensis, respectively) were also the most abundant species, we suspect they influence a number of ecological processes that regulate species diversity on disturbed roadside slopes. Firstly, dominance of I. cylindrica on sandstone and M. sinensis on shale may allow them to strongly compete for limiting soil nutrients and potentially displace resident species [72,73]. For example, once established, dominant perennial grasses are known to thrive on low soil nutrient conditions and heavily compete with species that arrive later in succession . Similarly, dominant perennial grasses reduced annual net biomass production of subordinate species after long-term prairie restoration experiments . Secondly, dominant perennial grasses may provide inhospitable conditions for the establishment of subordinate species, even when they readily arrive to these roadside plant communities. For example, perennial grasses can modify under-canopy light condition, soil chemistry, and nutrient cycling to favor their own dominance while limiting the germination and growth of subordinate species [75-77]. Furthermore, dominant species are often superior competitors even with species of the same functional group , which provides an explanation for why the perennial grass Eriophorum vaginatum remained subordinate to dominant perennial grass on both substrates in our study. Given the potential influence of dominant species on these ecological processes, we suggest that further research is needed to evaluate competitive interactions in an overall effort to better understand colonization limitations, increase functional group diversity, and to identify suitable restoration species to successfully coexist with dominant species. The indicator species we highlight above provide reliable field indicies of prospective sandstone and shale substrates and assist in developing site-specific restoration plans. Based on our analysis of soil depth and texture, sandstone substrates are not only generally devoid of trees, but I. cylindrica will likely be the most abundant perennial grass at intermediate soil depths (i.e., 20-30 cm). Alternatively, when field assessments identify the presence of the annual sedge Cyperus microiria and the perennial grass M. sinensis at a site, our results denote that soils are likely deeper (i.e., > 30 cm). Edaphic conditions of sandstone substrates can be further delineated by the presence of the perennial grass Cymbopogon goeringii, which signifies sandy loam soils. Similar to sandstone, M. sinensis served as an indicator of deeper soils (i.e., 20-30 cm) on shale substrate, but no indicator species were found for soil texture classes. While our results provide a rudimentary framework to classify roadside vegetation and edaphic conditions using a few indicator species, additional research is needed to understand how the performance of these indicator species may shift during plant community development . Future research should also be conducted in situ to identify species for remediation of disturbed roadside slopes . In addition to indicator species, many of the perennial grasses we found on our study locations are known to perform well for roadside slope restoration in southern Asia, and thus, deserve further attention. For example, Pogonatherum paniceum occurred only on sandstone substrate, and previous research indicates that this species may also be well suited for slope restoration because it has higher seed production, establishment frequency, and maximum root length compared to other species on rocky slopes in southern China . In addition, P. paniceum has been recommended for roadside restoration in other ecosystems due to its ability to survive under prolonged low soil moisture (e.g., 2-4 %; ). Similarly, Cynodon dactylon is a prostrate stoloniferous grass known to prefer sites with loamy soil and high solar radiation , yet its occurrence on shale substrates in our study suggest it may also be well-suited species to coexist with the dominant I. cylindrica on sandstone and potentially interfere less with tree establishment. Aside from these two species, future research should also evaluate the suitability of species with known colonization ability and tolerance to stressful environmental conditions typical of roadside slopes in Sichuan Basin. For example, although we did not encounter the perennial grasses Eragrostis curvula and Eremochloa ophiuroides on sandstone substrates, both are known to perform well on sandy soil with lower moisture [83-85]. Similarly, we suggest future research should be performed to identify how the large-statured perennial grass Paspalum notatum, which has been shown to intercept rainfall and prevent erosion of roadside slopes [58,86], may coexist with dominant perennial grasses on sandstone and shale substrates and improve slope stability. In this study, we found no differences in vegetation structure between sandstone and shale substrate, or among soil texture and soil depth levels across Sichuan Basin roadside slopes. 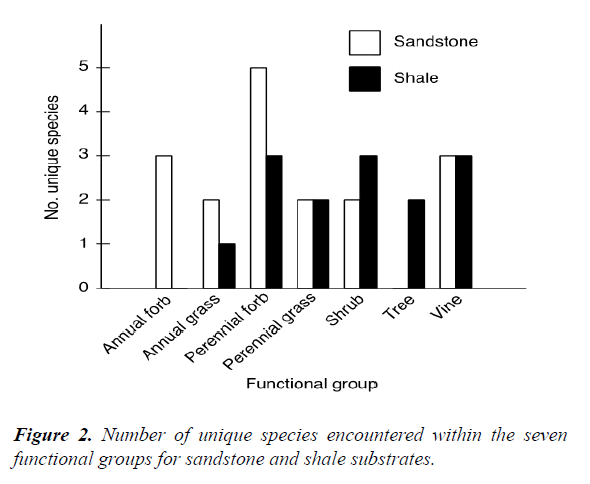 In contrast, differences between substrates were primarily due to species composition and the presence of two perennial grasses that appear to strongly influence species interactions and diversity on sandstone and shale. Perennial grasses were more commonly indicators of soil conditions compared to six other functional groups. In addition, the principal perennial grass indicators (i.e., I. cylindrica on sandstone, and M. sinensis on shale) were also the most dominant species, suggesting the possibility that they may be competitively displacing subordinate species, especially those of the same functional group. Dominant perennial grasses also appear to be limiting the colonization of species within these plant communities as evidenced by the lack of tree species on sandstone substrates, where I. cylindrica is know to strongly regulate forest succession in southern Asia. To address these potential mechanisms regulating species diversity, we suggest that future research should explore the outcome of competition between these dominant perennial grasses and candidate restoration species that were identified to successfully stabilize roadside slopes in our study. For example, our results identified a number of subordinate species that currently coexist with these dominant species, yet research is needed to determine whether they may be suitable for broader use in Sichuan Basin. Lastly, although species composition and vegetation structure were not strongly influenced by variation in soil texture and depth in our study, we did, however, identify indicator species for both of these edaphic factors. Overall, the six indicator species we identified can be used to denote specific edaphic conditions, while our interpretations of species interactions and successional dynamics of roadside slopes offer guidance to choosing suitable species for future restoration projects in Sichuan Basin of China. This work was funded by Science and Technology Department of Sichuan Province, China (2012SZ0176). Huiqin He conceived and designed the study, oversaw data collection, and conducted all vegetation sampling; Huiqin He and Thomas Monaco analyzed the data and co-wrote the paper. Both authors have read and approved the final manuscript. The authors declare no conflict of interest. The funding sponsors had no role in the design of the study; in the collection, analyses or interpretation of data; in the writing of the manuscript, and in the decision to publish the results. Coffin AW. From roadkill to road ecology: A review of the ecological effects of roads. J Transp Geogr. 2007;15:396-406. Cui BS, Zhao SQ, Zhang KJ, et al. Disturbance of Dabao highway construction on plant species and soil nutrients in Longitudinal Range Gorge Region (LRGR) of southwestern China. Environ Monit Assess. 2009;158:545-59. Godefroid S, Oedam NK. The impact of forest paths upon adjacent vegetation: effects of the path surfacing material on the species composition and soil compaction. Biol Conser. 2004;119:405-19. Fu W, Liu S, Dong S. Landscape pattern changes under the disturbance of road networks. Proc Environ Sci. 2010;2:859-67. Donaldson JE, Richardson DM, Wilson JRU. Scale-area curves: a tool for understanding the ecology and distribution of invasive tree species. Biol Invas 2013;16:553-63. Walton M, Gadzia T, Zeedyk WD. Characterization and restoration of slope wetlands in New Mexico: a guide for understanding slope wetlands, causes of degradation and treatment options. New Mexico Environmental Department: Santa Fe, NM, USA. 2014:68. Doley D, Audet P. Adopting novel ecosystems as suitable rehabilitation alternatives for former mine sites. Ecol Process. 2013;2:22. Bochet E, Garcia-Fayos P. Factors controlling vegetation establishment and water erosion on motorway slopes in Valencia, Spain. Restor Ecol. 2004;12:166-74. Dong SK, Yang ZF, Cui BS, et al. Impacts of environmental factors and human disturbance on composition of roadside vegetation in Xishuangbanna National Nature Reserve of southwest China. Proc Environ Sci. 2010;2:1213-19. Lyaruu HV. The influence of soil characteristics on plant species diversity and their distribution patterns in western Serengeti, Tanzania. Agric J. 2010;5:234-41. Rentch JS, Fortney RH, Stephenson SL, et al. Adams, H.S. ; Grafton, W.N. ; Anderson, J.T. Vegetation–site relationships of roadside plant communities in West Virginia, USA. J Appl Ecol. 2005;42:129-38. Deduke C, Halden NM, Piercey-Normore MD. Comparing element composition of rock substratum with lichen communities and the fecundity of Arctoparmelia and Xanthoparmelia species. Botany. 2016;94:41-51. Walker LR, Shiels AB, Bellingham PJ, et al. Changes in abiotic influences on seed plants and ferns during 18 years of primary succession on Puerto Rican landslides. J Ecol. 2013;101:650-61. Hahm WJ, Riebe CS, Lukens CE, et al. Bedrock composition regulates mountain ecosystems and landscape evolution. Proc Nat Acad Sci, USA. 2014;111:3338-43. Ullmann I, Bannister P, Wilson JB. The vegetation of roadside verges with respect to environmental gradients in southern New Zealand. J Veg Sci. 1995;6:131-42. Abella SR, Springer JD. Canopy-tree influences along a soil parent material gradient in Pinus ponderosa-Quercus gambelii forests, northern Arizona. J Torrey Bot Soc. 2008;135:26-36. Binkley D, Suarez F, Rhoades C, et al. Parent material depth controls ecosystem composition and function on a riverside terrace in northwestern Alaska. Écoscience. 1995;2:377-81. Casas C, Ninot JM. Correlation between species composition and soil properties in the pastures of Plana de Vic (Catalonia, Spain). Acta Bot Barcelona. 2003;49:291-310. El-Ghani. M.M.A. Environmental correlates of species distribution in arid desert ecosystems of eastern Egypt. J Arid Env. 1998;38:297-313. Bochet E, Garcıa-Fayos P, Tormo J. Road slope revegetation in semiarid mediterranean environments. Part I: Seed dispersal and spontaneous colonization. Restor Ecol. 2007;15:88-96. Neher DA, Asmussen D, Lovell ST. Roads in northern hardwood forests affect adjacent plant communities and soil chemistry in proportion to the maintained roadside area. Sci Total Environ. 2013;449:320-27. Parsakhoo A, Hosseini SA, Pourmajidian MR. Plants canopy coverage at the edge of main communications network in Hyrcanian forests. J Ecol Natural Environ. 2009;1:37-44. Li Y, Gao Z, Tang L. Soil-plant characteristics in an age sequence of Coronilla varia L. plantations along embankments. J Soil Sci Plant Nutr. 2016;16:187-99. Zeng SL, Zhang TT, Gao Y, et al. Road effects on vegetation composition in a saline environment. J Plant Ecol. 2011;1-13. Osman KT. Physical properties of forest soils. In Forest soils: properties and management, Springer International Publishing: Gewerbestrasse, Switzerland. 2013:19-28. Peterman W, Bachelet D, Ferschweiler K, et al. Soil depth affects simulated carbon and water in the MC2 dynamic global vegetation model. Ecol Model. 2014;294:84-93. Khumalo G, Holechek J, Thomas M, et al. Soil depth and climatic effects on desert vegetation dynamics. Rangeland Ecol Manag. 2008;61:269-74. Dornbush ME, Wilsey BJ. Experimental manipulation of soil depth alters species richness and co-occurrence in restored tallgrass prairie. J Ecol. 2010;98:117-25. Arabas KB. Spatial and temporal relationships among fire frequency, vegetation, and soil depth in an eastern North American serpentine barren. J Torrey Bot Soc. 2000;127:51-65. Abella SR, Crouse JE, Covington WW, et al. Diverse responses across soil parent materials during ecological restoration. Restor Ecol. 2015;23:113-21. Ottaviani G, Marcantonio M, Mucina L. Soil depth shapes plant functional diversity in granite outcrops vegetation of southwestern Australia. Plant Ecol Divers. 2016;9:263-76. Leonard JM, Medina AL, Neary DG, et al. The influence of parent material on vegetation response 15 years after the Dude Fire, Arizona. Forests. 2015;6:613-35. Fort F, Cruz P, Lecloux E, et al. Grassland root functional parameters vary according to a community-level resource acquisition–conservation trade-off. J Veg Sci. 2016;27:749–58. Parker KC. Topography, substrate, and vegetation patterns in the northern Sonoran desert. J Biogeogr. 1991;18:151-63. Korsch RJ, Huazhao M, Zhaocai S, et al. The Sichuan Basin, southwest China: a late proterozoic (Sinian) petroleum province. Precambrian Res. 1991;54:45-63. Xie Z. Characteristics and conservation priority of threatened plants in the Yangtze valley. Biodivers Conser. 2003;12:65-72. Tang CQ, Yang Y, Ohsawa M, et al. Community structure and survival of tertiary relict Thuja sutchuenensis (Cupressaceae) in the subtropical Daba Mountains, southwestern China. PLoS ONE. 2015;10:e0125307. He H, Li S, Sun H, et al. Environmental factors of road slope stability in mountain area using principal component analysis and hierarchy cluster. Environ Earth Sci. 2011;62:55-9. Pang L, Li S, Long F, et al. Quantitative classification and ordination of roadside slope vegetation in Sichuan Basin. Bull Bot Res. 2013;33:360-66. He H, Monaco T. Litter accumulation and nutrient content of roadside plant communities in Sichuan Basin, China. Plants. 2017;6:36. Hua K, Zhu B, Wang X. Dissolved organic carbon loss fluxes through runoff and sediment on sloping upland of purple soil in the Sichuan Basin. Nutr Cycl Agroecosys. 2014;98:125-35. Wang C, Li S, Xia J, et al. Clay composition and fertilizer conservation property of red soil and yellow soils in the southwest. J Sichuan Agric Univ. 1996;2:211-18. Li Q, Ma M, Liu Y, et al. Study on soil carbon and nutrients pools of several evergreen broad-leaved forest types in northwest Sichuan. J Soil Water Conserv. 2007;6:114-25. Ding S, Song Y. Research advances in vegetation dynamic of evergreen broad-leaved forest. Acta Ecol Sinica. 2004;24: 1765-75. Peng W, Wang G, Zhou J, et al. Studies on the temporal and spatial variations of urban expansion in Chengdu, western China, from 1978 to 2010. Sustain. Cities Soc. 2015;17:141-50. Jennings SB, Brown ND, Sheil D. Assessing forest canopies and understorey illumination: canopy closure, canopy cover and other measures. Forestry. 1999;72:59-74. Gee GW, Bauder JW. Particle-size analysis. In Methods of soil analysis. Part 1. Physical and mineralogical methods, Klute, A., Ed. Soil Science Society of America, Madison, WI, USA. 1986:383-411. Thomas GW. Soil pH and soil acidity. In Methods of soil analysis, Sparks DL, Page AL, Helmke PA, et al. Eds. Soil Science Society of America: Madison, WI, USA. 1996:475-90. Volin JC, Lott MS, Muss JD, et al. Predicting rapid invasion of the Florida Everglades by Old World climbing fern (Lygodium microphyllum). Divers Distrib. 2004;10:439-46. Bertuzzi R, Pells PJN. Geotechnical parameters of sydney sandstone and shale. Austral Geomech. 2002;37:41-54. McCune B. Improving community analysis with the Beals smoothing function. Écoscience. 1994;1:82-6. McCune B, Grace JB. MRPP (Multiple-response permutation procesures) and related techniques. In Analysis of ecological communities MjM Software Design, Gleneden Beach, OR, USA. 2002:188-97. Bray JR, Curtis JT. An ordination of the upland forest communities of southern Wisconsin. Ecol Monogr. 1957;27:326-49. Dufrene M, Legendre P. Species assemblages and indicator species: the need for a flexible asymmetrical approach. Ecol Monogr. 1997;67:345-66. Reich A, Tilman D, Naeem S, et al. Species and functional group diversity independently influence biomass accumulation and its responses to CO2 and N. Proceedings of the National Academy of Sciences USA. 2004;101:10101-106. Lanta V, Leps J. Effect of functional group richness and species richness in manipulated productivity-diversity studies: a glasshouse pot experiment. Acta Oecol. 2006;29:85-96. Xu K, Ye W, Cao H, et al. The role of diversity and functional traits of species in community invasibility. Bot Bull Academ Sinica. 2004;45:149-57. Seabloom EW, Borer ET, Buckley Y, et al. Predicting invasion in grassland ecosystems: is exotic dominance the real embarrassment of richness. Global Change Biol. 2013;19:3677-87. Holzmueller EJ, Jose S. Response of the invasive grass Imperata cylindrica to disturbance in the southeastern forests, USA. Forests. 2012;3:853-63. Dougherty RF, Quinn LD, Endres AB, et al. Natural history survey of the ornamental grass Miscanthus sinensis in the introduced range. Invas Plant Sci Manage. 2017;7:113-20. Quinn LD, Stewart JR, Yamada T, et al. Environmental tolerances of Miscanthus sinensis in invasive and native populations. Bioenergy Res. 2012;5:139-48. Tsuyuzaki S. Miscanthus sinensis grassland is an indicator plant community to predict forest regeneration and development on ski slopes in Japan. Ecol Indic. 2005;5:109-15. Yang L, Ren H, Liu N, et al. Can perennial dominant grass Miscanthus sinensis be nurse plant in recovery of degraded hilly land landscape in south China? Landsc Ecol Eng. 2013;9:213-25. Yamada S, Nemoto M. Effects of bare-ground revegetation techniques using imperata cylindrica on changes in the plant cover and species richness during early succession. Open J Ecol. 2016;6:471-83. Hagan DL, Jose S, Lin CH. Allelopathic exudates of cogongrass (Imperata cylindrica): implications for the performance of native pine savanna plant species in the southeastern US. J Chem Ecol. 2013;39:312-22. MacDonald GE. Cogongrass (Imperata cylindrica)—Biology, Ecology, and Management. Crit Rev Plant Sci. 2004;23:367-80. Tamang B, Rockwood DL, Langholtz M, et al. Fast-growing trees for cogongrass (Imperata cylindrica) suppression and enhanced colonization of understory plant species on a phosphate-mine clay settling area. Ecol Eng. 2008;32:329-36. Yager LY, Miller DL, Jones J. Woody shrubs as a barrier to invasion by cogongrass (Imperata cylindrica). Invas Plant Sci Manage. 2008;4:207-11. Pokorny ML, Sheley RL, Zabinski CA, et al. Plant functional group diversity as a mechanism for invasion resistance. Restor Ecol. 2005;13:448-59. Sasaki T, Okubo S, Okayasu T, et al. Indicator species and functional groups as predictors of proximity to ecological thresholds in Mongolian rangelands. Plant Ecol. 2011;212:327-42. Auerbach NA, Walker MD, Walker DA. Effects pf roadside disturbance on susbstrate and vegetation properties in Arctic Tundra. Ecol Appl. 1997;7:218-35. O’Dell RE, Young SL, Claassen VP. Native roadside perennial grasses persist a decade after planting in the Sacramento Valley. Calif Agric. 2007;61:79-84. McGlone CM, Sieg CH, Kolb TE. Invasion resistance and persistence: established plants win, even with disturbance and high propagule pressure. Biol Invas. 2011;13:291-304. McCain KNS, Baer SG, Blair JM, et al. Dominant grasses suppress local diversity in restored tallgrass prairie. Restor Ecol. 2010;18:40-9. Monaco TA, Briske DD. Contrasting shade avoidance responses in two perennial grasses: a field investigation in simulated sparse and dense canopies. Plant Ecol. 2001;156:173-82. Perkins LB, Hatfield G. Competition, legacy, and priority and the success of three invasive species. Biol Invas. 2014;16:2543-50. Young SL, Barney JN, Kyser GB, et al. Functionally similar species confer greater resistance to invasion: implications for grassland restoration. Restor Ecol. 2009;17:884-92. Karim MN, Mallik AU. Roadside revegetation by native plants I. Roadside microhabitats, floristic zonation and species traits. Ecol Eng. 2008;32:222-37. Wang H, Peng L, Li S, et al. Growth characteristics of rock plant Pogonatherum paniceum. Chinese Journal of Applied Ecology. 2005;16:1432-36. Zuo Y, Li SC, Yang ZR, et al. Growth of rock plant Pogonatherum paniceum under different soil moisture content. J Sichuan Univ Nat Sci Ed. 2006;43:1142-45. Dong M, De Kroon H. Plasticity in morphology and biomass allocation in Cynodon dactylon, a grass species forming stolons and rhizomes. Oikos. 1994;70:99-106. Li Y, Gan YM, Li P, et al. Study on vegetation restoration of road slope in Ganzi Prefecture, Sichuan. Practaculture Animal Husbandry. 2015;6:31-9. Xu XG, Wang JP, Yang DS, et al. Study on adaptation of Eragrostis curvala grass planting on effloresce rock slope. Highway. 2003;11:106-8. Zhao MK, Liu XF, Tang CB. Selection of land-cover plant for afforesting highway side-slope land and its biological characters. Guizhou Agric Sci. 2004;32:18-21. Li X, Zhang XQ. Important function of herbs in rectifying desertification as well as slope protection and landscaping for highways and railways. Practaculture Animal Husbandry. 2003;5:4-6.